We would all like to earn more free travel, but what should you do to get the necessary miles sooner? How much do you spend on utilities, groceries and bills every month? Hundreds, maybe thousands, right? If you earn thousands of points with you every day spendings, in 12 months you can get enough bonuses for a free flight, maybe even free hotel! You pay with your credit card at the gas station or in any kind of store, but did ever consider paying a phone bill or any bill for that matter the same way ? Check your monthly banking statement and reassigned to your card as many of the purchases as you can. Even rent could be paid with a credit card, if you live in a home managed by a company accepting credit cards. This can all help you get a free vacation every year! You can even pay government taxes with a credit card, and as unhappy an event as that is, at least it contributes in your earning of a free trip. Check the below cards and the huge account opening bonuses that they all have, pick one you would pay your bills with, pick one and then transform your phone, electricity and water bills into free travel. 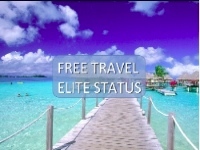 Miles never expire and there is no mile earning limitation! 16 Rapid Reward credits (equivalent of 25K bonus miles on other airlines) after your first purchase. Earn $50 back at your first purchase. No Fee the first year of membership. Get 10K points upfront, 15K for spending $15,000 in the first half year of membership, for a total of 25,000 Starpoints(R) – enough for two free nights at any category 6 hotel. Redeem Starpoints(R) for free nights at over a thousand hotels and resorts in almost 100 countries and for free flights on more than 350 airlines – with no blackout dates. 20K extra ThankYou Points after $1,000 spent within 3 months of signing up. Earn a FREE FLIGHT – that’s 25,000 bonus points after you spend $3,000 in the first 3 months!